See complete release notes in Jira. Download camunda BPM 7.2.0-alpha4 now. Case execution listener can be added for the following state transitions: close, complete, create, disable, enable, exit, manualStart, occur, parentResume, parentSuspend, parentTerminate, reactivate, reenable, resume, start, suspend and terminate. Task listener on human tasks are triggered for the following events: assignment, complete, create and delete. Case execution listeners and task listeners on human task which do not specify a event will be triggered on all previous listed events. The CMMN Listeners support all features of our BPMN Listeners like field injection or script execution. After a refactoring of our front end projects and infrastructure finally new features are arriving in the tasklist. Embedded forms of processes and tasks are now visible in the tasklist. There were some major changes to the forms SDK which will improve the performance and the variable handling of your forms. 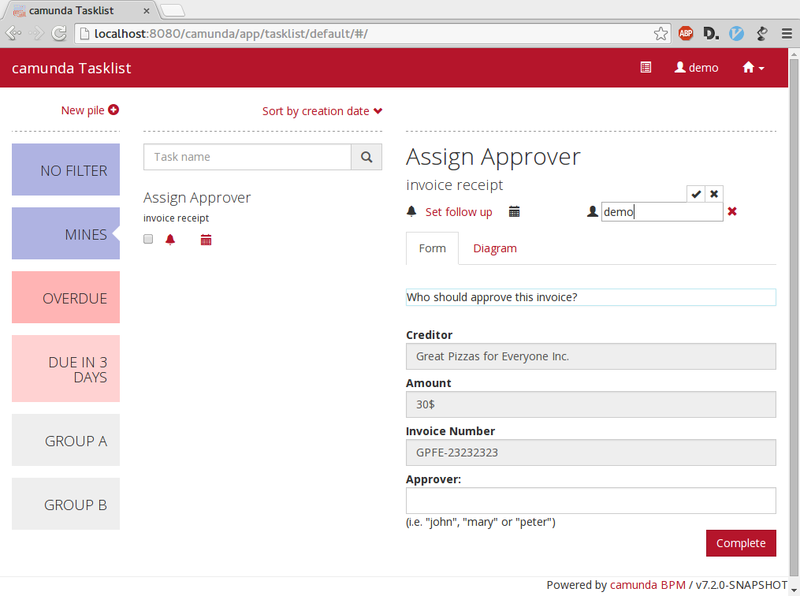 For a sneak peak of the new features see the docs of the camunda-bpm-sdk-js. Also tasks can now be assigned from the task list and are correctly displayed by the available filters. Filtered tasklist with an embedded form. The assignee can be changed directly from the tasklist. It is now possible to read, modify and write JSON with camunda Spin. For more information on all features please see the documentation. Besides the manipulation of JSON it is also possible to map Java Objects to their JSON representation and vice versa. This feature will be used by the process engine to improve the serialization of Java Objects inside a process instance. It is already implemented in the core of the engine but not yet available from the public API. With the new camunda Connect REST HTTP Connector we provide a low level connector to access REST APIs from a BPMN process. A simple example process which demonstrates the new connector in combination with variable mappings and script execution can be found in our examples repository.